Heart of Gold is the perfect follow-up to Heart of the Universe, showing readers more specifically how the universe’s great creative force relates to their life and, just as importantly, how we can harness its power to uplift and enhance it. Discover the “intelligence” of the universe’s creative process. Recognize how the creative forces shaping the universe are the same forces molding and shaping our lives. Learn how the universe generates harmony and how you can generate the same in their life. Grasp how important ‘beginnings’ are to all things that follow. Understand how cultivating strong ‘centers’ can directly translate to a more balanced life. 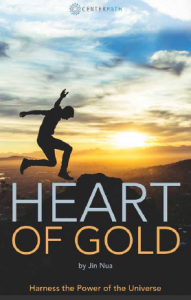 Click here to buy Heart of Gold in .pdf format! You can also buy Heart of Gold in Kindle format on Amazon. Check out this VDO to see more on how Heart of Gold can improve your life!